DonorSearch’s prospect research tools provide invaluable data on donor giving capacity from more than 25 top databases. This information is integrated with DonorPerfect so you can identify greater giving potential and capacity from your current donors or from an acquisition list. Below is an example of what the DonorSearch information will look like in your DonorPerfect system, followed by a description of each field. A ranking of a prospect’s ability and propensity to make $5,000+ donations. Confidence level of name matching to donor records. Anything over 18 indicates a high degree of confidence. An internal analysis of the relationship you have with each of your prospects, using a formula that includes how RECENTLY your prospect has given to you, how FREQUENTLY your prospect has given to you, and the total amount of MONEY given. Scale of 1-300. 300 is the highest rating and indicates the greatest likelihood of donating. DonorSearch manually assesses the top 100 prospects in your database as quality assurance that all data is correct to an 85-90% level at no extra charge. Dollar amount of all positive matches to outside giving history found for the record. This total does not include “maybe” donations. Number of unique positive matches to outside giving history found for the record. This quantity does not include “maybe” donations. Identifies whether the prospect is on the board of a foundation. Indicates whether the prospect is on the board of a grant-seeking foundation. Identifies whether the prospect is associated with a namesake grant-giving foundation. Dollar amount of all political donations. This is a strong philanthropy indicator–$15K in 15 political gifts typically indicates a 5-7 figure charitable gift elsewhere. Total dollar amount of all properties affiliated with the prospect. Values over $1 million are highlighted in green, with darker green corresponding to higher values. Number of different properties matched to the prospect. Dollar value of any SEC reported stock options. Identifies whether the prospect has stock options related to being a company insider or high-ranking employee that must therefore be reported. Identifies whether the prospect has been matched to the Reuters Market Guide database on company insiders. Dollar value of any Market Guide reported company compensation for a given year. Dollar value of any Market Guide reported stock options executed. Dollar value of revenues at a Dun & Bradstreet firm at which the prospect is an executive-level employee. Revenues over $1 million are highlighted in light green, and revenues over $5M are highlighted dark green. These revenues are reported by the company or estimated by Dun & Bradstreet, and thus may be distorted. Identifies whether the prospect has been matched to a Dun & Bradstreet firm at an executive level position. Identifies whether the prospect has been matched to the Larkspur SEP/Keogh Pensions database as having deferred income or a qualified pension plan. Dollar value of Larkspur/ Keogh pension plan or deferred income; not all assets may belong to the prospect. Rating that shows the prospect’s likelihood to be an annual fund donor based upon a combination of external giving matches and giving history to the client’s organization. 300 = most likely; 0 = least likely. If there is no internal history, the rating will be based on external giving only. Rating that shows the prospect’s likelihood to be a major gift donor based upon a combination of external giving matches and giving history to the client’s organization. 300 = most likely; 0 = least likely. If there are no wealth matches, the rating will be based on external giving only. 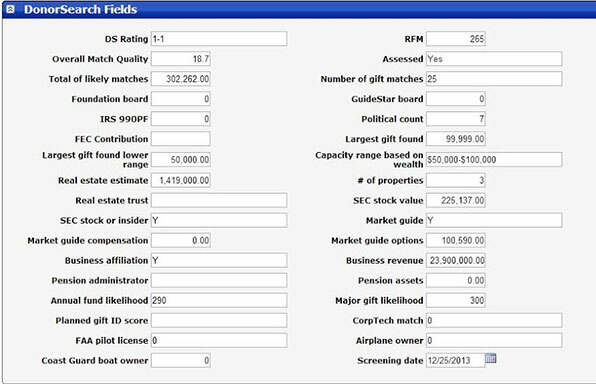 Rating that shows the prospect’s likelihood to be a planned gift donor based upon a combination of internal giving matches and the prospect’s age. 300 = most likely; 0 = least likely. If there is no internal history, the rating will be based on external giving only. The age of the prospect is required for this analysis. Indicates if the prospect is profiled in the Corp tech database, a database of busi-ness executives similar to Dun & Bradstreet. Y = Yes, Blank = No. Identifies if the prospect has a pilot’s license and is in the FAA database. Identifies if the prospect is an airplane owner. Identifies if the prospect is a boat owner and is in the Coast Guard database.